In the past, I have always encourage females to opt for the occasional makeover. More specifically, to change something within yourself every season. By now, you already know I enjoy giving myself a new look frequently. However, being pregnant has required me to budget. Accordingly, I decided to pick up my favorite shade from the Schwarzkopf color ULTÎME® line to save some cash. Keep in mind, a makeover shouldn’t have to cost a fortune and Walmart has made it possible to stay within a budget. Before starting the application, place protection to the surface and a watch nearby to monitor the application time. Also, wear old clothing for possibly stains. Put on the old clothing and the gloves supplied. Twist the application tip from the application bottle. Pour the Color Creme tube (4.1 Rich Brown) by piercing the tube with the reverse side of the cap. Carefully squeeze the entire mixture into the application tube. Then, place the cap back on the application bottle and close it properly. Shake the bottle vigorously until all ingredients are mixed into a smooth cream. Finally, twist off the tip of the cap and immediately start with the application process. Apply the entire mixture strand after strand, on dry hair. Then, massage the mixture in with your fingertips. Leave on your hair to develop for the recommended 30 minutes. At the end, of the processing time rinse the hair with warm water. Rinse thoroughly until the water runs clear. Afterwards, massage the specially developed Conditioning Treatment with Diamond Brilliance Serum into towel dried hair and leave it in for 2 minutes. Then, rinse thoroughly! Depending on the length of your hair, the conditioner can be used up to 3-4 times. As I was dying my hair I started to brainstorm on what I look for in a hair dye. For instance, a hair color that can last for couple of weeks. 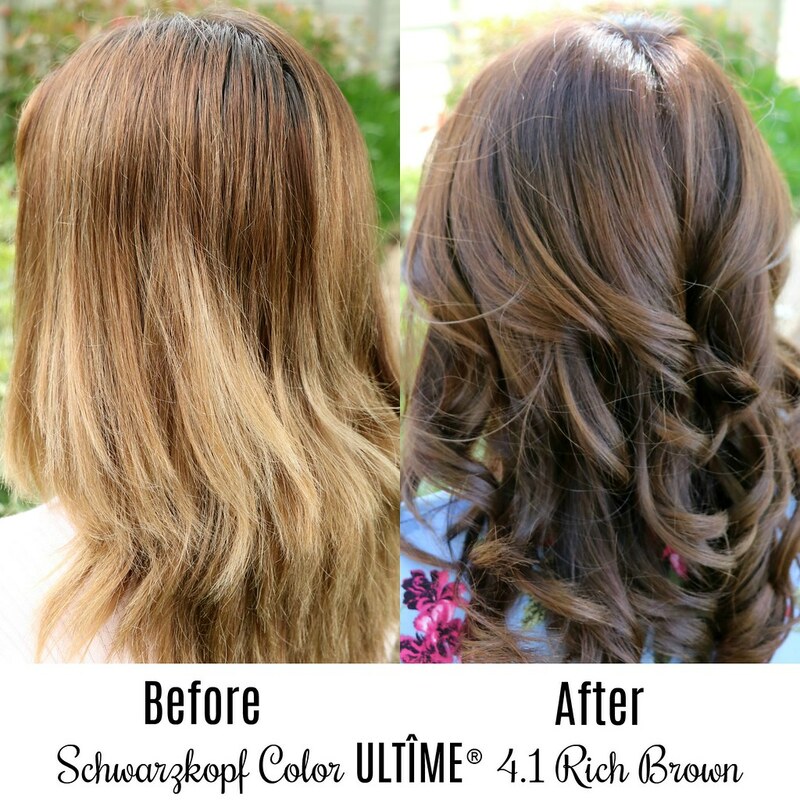 Thankfully, Schwarzkopf color ULTÎME® is a vibrant hair color that defies fading for up to 9 weeks. As a result, I felt reassured my hair will remain full of life for the upcoming Maternity Shoot I have scheduled in late May. In addition, Schwarzkopf also provides colors freshness, shine, and a true to box color result for an affordable price. In all honesty, I was delighted to see the final result after using Schwarzkopf color ULTÎME® in 4.1 Rich Brown. After, a hair dying session in the comfort of my house, a conditioning hair treatment, and bouncy curls I am ready to welcome Spring. For this reason, I need clothing pieces that are spring appropriate, comfortable, and affordable. With this in mind, I found Pink Blush to be the ideal pregnancy clothing line to wear this season. 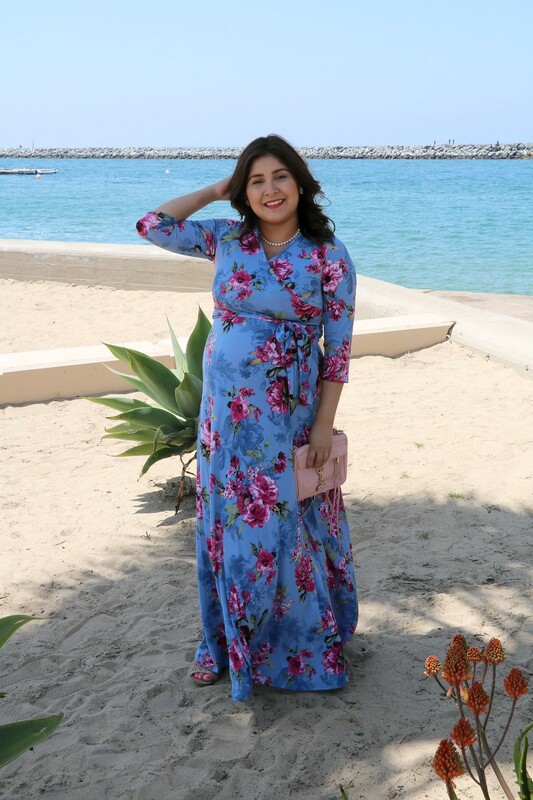 For instance, this Blue Floral Sash Tie Maternity/Nursing Maxi Dress made me feel beautiful inside and out. During, the past couple of weeks I’ve struggled to find pieces that are fashionable, budget friendly, and fit the ever growing bump I have. 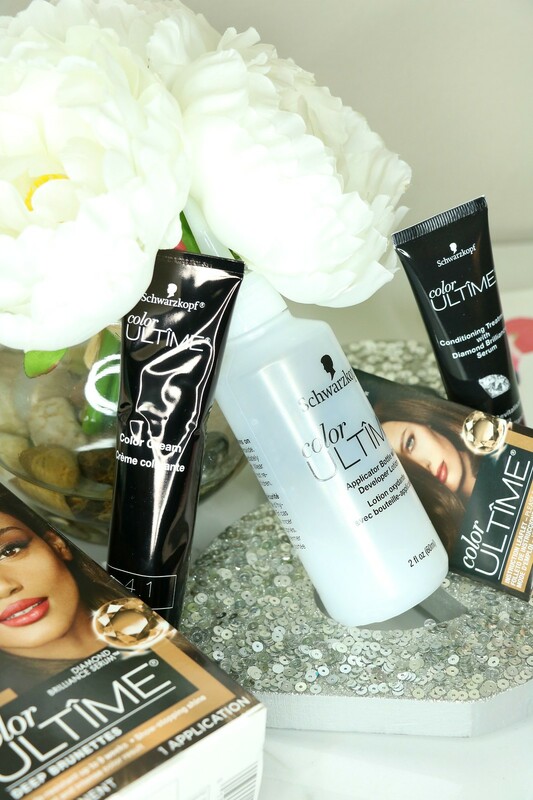 Lastly, I am thrilled to have found Schwarzkopf color ULTÎME® to help me look my best this season! Before any application, please read the safety instructions on the reverse side of the instructions carefully. Do perform an allergy alert test, even if you have colored your hair previously. It looks like a great hair color product and I do like the end result it looks so natural and smooth. wow that is a great before and after, will have to check it out and you look adorable pregaant, congrats. The floral dress is such a beautiful summery color. I like that the dress is long because it gives it an elegant look. These looks are all so cute. Being a cute mommy is such a fun trend! Such a cute post! I really love the featured hairstyle, such a cute addition to any outfit. Your hair color is amazing! I can’t believe you did that yourself. I definitely feel motivated to give myself a makeover. How beautiful! I love the rich color! Such a beautiful mama! I like the new hair color. You look so young and so fresh! your dress is pretty too. I love the blue color and the prints too. The material looks so soft and comfortable. I love the hair color you choose. It looks fabulous on you, as does that amazing floral maxi. Such a beautiful look for spring.